We have been going full force over here before the upcoming blessed holidays. That’s because we have a goal. See, at Thanksgiving we share some of our best work with grandparents. They are a captive audience, bless them. I wrote about our Thanksgiving Homeschool Celebration at Heart of the Matter a several years ago. And I am so glad we’ve maintained this helpful habit. Because I don’t know about you, but I’ve found myself – mama the teacher – to be a little lack luster with all the Thanksgiving prep and the white space on the December calendar growing more scarce each day we get closer. This Thanksgiving Homeschool Celebration keeps the children busy too while I’m busy preparing the meal. “Mama, are we taking a Thanksgiving break?” one asked a couple days ago. “Yes, we are.” I answered. But the reading of seasonal books like Cranberry Thanksgiving, the counting of blessings and the finishing of projects will continue next week. 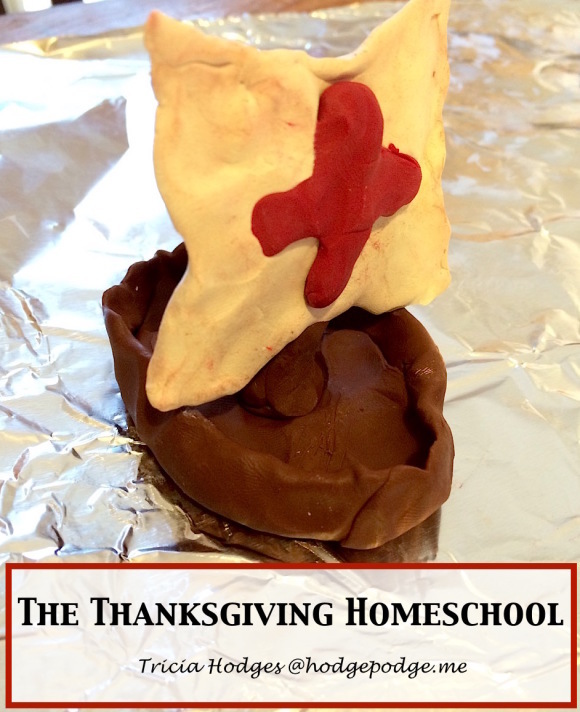 So, I’m sharing today some examples of how we do our Thanksgiving Homeschool Celebration. 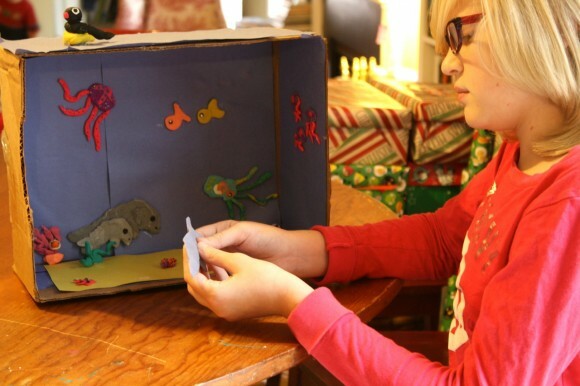 Middle Girl has been working along and along adding sea creatures to her Ocean Box project as part of Apologia Swimming Creatures of the Fifth Day studies. A captive audience. That’s what you have in family and friends on Thanksgiving. Each year at this time we share what we call a unit celebration of our homeschool. Basically, we show off the best of our school work, projects, art work while the side dishes are still warming in the oven. This tradition is rooted in our Tapestry of Grace studies. But, we not only share what we have learned about history, our children also might share an upcoming Christmas piano recital song they are practicing. Maybe a short skit they have put together. Big brother makes a video of it all. One afternoon it was an Answers in Genesis Homeschool History Revealed time. 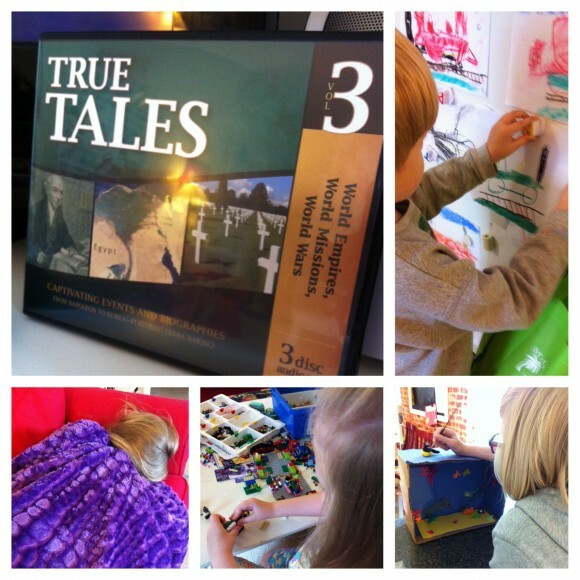 Listening to Diana Waring share about Napoleon while one makes chalk pastel trains, another builds with LEGO® Education StoryStarter, another makes clay sea creatures for Apologia science and another listens and rests. It’s a Hodgepodge homeschool. 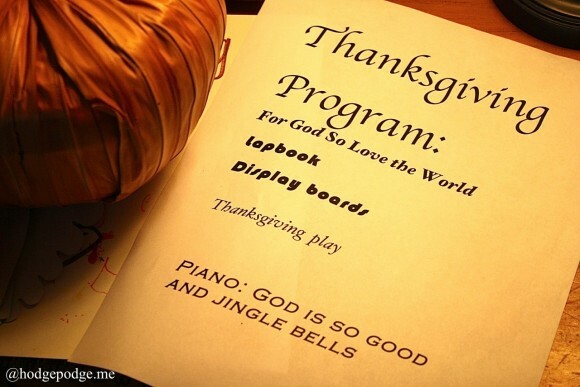 Why Have a Thanksgiving Homeschool Celebration? I’d say that most of us homeschoolers have a good amount of schooling and learning under our belts by Thanksgiving. It doesn’t matter if you are still in the midst of medieval time studies. What better time to share accomplishments, get a boost of praise from family about your schooling? Likely, many of our friends and relatives are curious about our homeschooling ways. Let them have a peek at the best parts. Let the children do the work. Allow the children to design the unit celebration program. 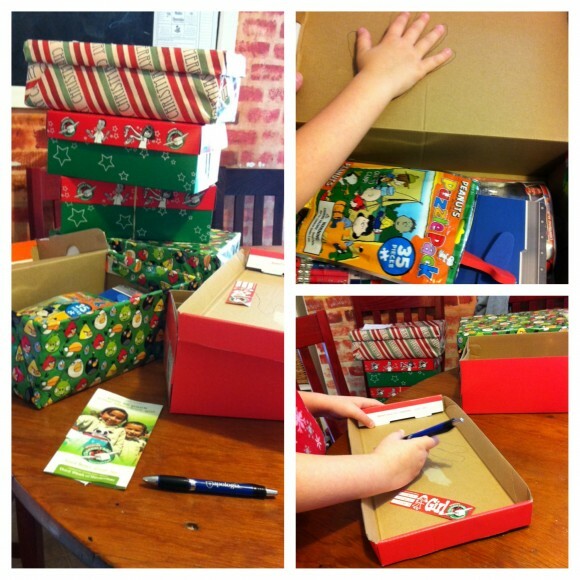 Soon it is drop off week for Operation Christmas Child Shoeboxes are we’re putting the last things in ours. Joy to the World! Can you see all the different life skills and subjects that can be counted while they are having fun? Tailor it to your studies. Design it for your family. Psst. It’s also a great opportunity to spread out all that paperwork, get a picture to preserve it for always, and then ‘refile’ (if you know what I mean). At Thanksgiving, it’s a good habit to celebrate your children and be thankful for your homeschool! Have a very Happy Thanksgiving, friends! What a wonderful time! Could you tell me what CD set that is? (True Tales) It looks great. Have a blessed Thanksgiving with your family. I have always admired your Thanksgiving Homeschool Celebration. Alas, we don’t have family for Thanksgiving, so we don’t have that captive audience. It brings me joy to see pictures of yours. I’m sorry to hear you don’t have family for Thanksgiving Phyllis – but you could do it for each other! Plus it’s a great chance to spread it all out and get several pictures. You do such a beautiful job with so much learning at your house! I also really love how the Swimming Creatures box is starting to look. Beautiful work! Wow I love that celebration idea! What a great way to celebrate the accomplishments! Happy thanksgiving! You are the best! Can’t wait to hear about it. Happy Thanksgiving!